You are reading page 33 of Nurses Call the Governor of Tennessee. If you want to start from the beginning Go to First Page. kdkout has 20 years experience. I think the nurse that made this series of mistakes is terrifying. I agree with Jory, and some other posters here. She bypassed SO many safety nets.....and, to top it off, went to work at another hospital. Unbelievable. Would you want her caring for you or your loved ones? Your newborn on a ventilator? Your wife in ICU? Come on, people. I say this as a nurse who has worked in so many fields, including ICU. I say this as a former preceptor. My God, have you ever been patients? I have, and I almost died as a result of 1 negligent nurse. One other time my husband was dropped right after surgery, by a negligent nurse, and needed a second surgery as a result. Both times we could've easily had a lawsuit. Both jobs I have done, so I know negligence when I see it. I didnt pursue a lawsuit because I didnt want money - I just wanted them to be fired from their jobs because the mistakes were so stupid and careless. A nursing student would've easily known better in both of our situations. And you know what? I am also alive because of excellent nursing care when I was later in ICU and near death. I know good care when I see it, and I know bad care when I see it.....and getting negligent care is absolutely terrifying. She should at a MINIMUM lose her license and not be able to work -in any capacity - in health care ever again. This is NOT the nurse to defend. Her actions are not defendable. Juan, I just want to say you are one of the most reasonable voices in this discussion and your posts have actually influenced my point of view several times. It was so odd to me that someone would go after you like that. Haha, thanks @mtmkjr, I think I've already said everything. I didn't post most of yesterday because it was Valentine's Day. Also, I have only been posting in the General Nursing forum more recently even though I've been a long time member. I have to say I'm with Wuzzie on this. Yes, the hospital is at least as culpable. If you've read every single post in every single related thread as I have, you'd know Wuzzie and many others do not think the hospital is at least as culpable. I do not claim to know what they think. I'm just saying I read in their other posts that they don't think the hospital is at least as culpable. This is what many people take issue with...many people who know how unsafe working conditions in hospitals can be and how those conditions can lead to prudent nurses making deadly mistakes. I completely agree. I would be curious if the same people who do not think she should be criminally charged (charged, not automatically found guilty) would feel the same way if it were a similar scenario in a field they weren’t directly involved in and thus not as passionate about. Not sure if everyone would be calling for it to just be handled internally if it were an airline pilot, truck driver, cab driver, etc. But I absolutely could be wrong. I probably shouldn't reply to the analogies unless they're in a thread not related to this case because, for one reason, analogies never match up perfectly, and for another reason I got jumped on in another thread for replying to analogies. Nevertheless, you said you'd be curious. So I'll let you know what I think about that. If a truck driver was expected by management to satisfy unreasonable work expectations in an understaffed business, and if that truck driver were well-meaning, aiming to please management, and ended up driving in an unsafe state of mind because of wanting to be a good worker --- and if that led to him hitting and killing someone in his tired state --- then I absolutely do not think he should be criminally charged. I think the business, be it delivery co. or hospital, should be held accountable when pressuring employees to work in an unsafe environment, or given unsafe work loads, or given unsafe work expectations. If penalization is warranted in those situations, take away their license then, but don't criminalize them. I know everyone has different ideas about exactly how culpable the hospital was. There are many who think that since the hospital was apparently a pit to work in (aren't most of them, any more?) that the nurse should be off the hook. I maintain that we are all responsible for our own practice. Based on everything I've read so far I think: 1. 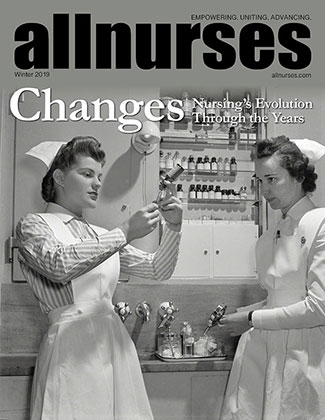 The nurse's actions rise (or sink) to the level of criminal charges being appropriate. 2. Now she gets her day in court and maybe a whole lot more information comes to light, in her favour or not. 3. Hopefully (and I know it's a long shot) typical hospital practices come to light and the public is outraged. 4. New nurses coming into the field will be taught to be assertive, proactive and not at all easy to intimidate. If we have any vestige of handmaiden status hanging on, we need to lose it yesterday. You know there was a situation almost identical to what you described: Tracy Morgan's car accident. Both the driver of the truck and Walmart were held accountable. You’re talking out of both sides of your mouth. You first say you know what I think then you say you don’t. Well, to clarify...you don’t and I’d appreciate if you’d not use my name specifically in your examples. As I have said over and over. The override and wrong medication is the least of the issues here. RV did not monitor the patient appropriately for the drug she thought she gave. If she had this patient would not be dead. All it would have taken is less than 5 minutes of eye-balling. That is 100% on her. We are ultimately responsible for each of our individual practices. Nobody is going to make me do something that I know is wrong. Nobody. It’s called ethics. This is what many people take issue with...many people who know how unsafe working conditions in hospitals can be and how those conditions can lead to prudent nurses making deadly mistakes. FTR I have worked in hospitals for three decades now so I’m well aware of the shenanigans that go on. But I, alone, am responsible for my practice as a nurse. Not the hospital, not my manager. At the end of the day it is MY decision to practice good nursing judgment and to protect my patients at all costs. Wuzzie, we all see how badly you want to see this nurse be charged guilty as a criminal. Would you be willing to elaborate on what would be enough for you to feel justice was served? How many years in prison alongside willful murderers should she serve in your opinion? I can’t answer that because I don’t have an opinion on what her punishment should be. I don’t know if I even care if she doesn’t go to jail at all but I believe she should, at the very least, face a judge and explain herself. The courts can decide from there. I have to say I'm with Wuzzie on this. And I wanted to point out that the quote from TriciaJ that you just quoted had nothing to do with my thoughts on the culpability of the hospital. The quotes above are a question from you, my response and Tricia’s agreement about the nurse explaining herself. They are in chronological order. Please don’t conflate the two issues in order to support your argument and/or infer what I think. You are assuming I didn't read them. I read them. You are wrong. You can shout it from the rooftops all you want. You are still wrong. Well then you'd know, despite your comment about intent, that intent is not the issue. We can agree there was no intent to kill and still disagree that she is guilty of reckless homicide. I suggest you look up the criteria for reckless homicide in the state of Tennessee. It fits exactly. This is the same criteria that is used when someone's WILLFUL negligence causes the death of another. The fact she is a nurse DOES NOT MATTER. Based on the criteria for reckless homicide that people have posted, I disagree she should be found guilty of it in spite of all the 7 or 8 ways you pointed out that she erred. I agree with you the ways she erred. I just don't think it makes her a criminal from how the law could be interpreted. Yes, law is subjective. And I don't see her many failings as willfully zipping past 8 safety measures, though I understand why you do. I instead view it as one tragic, fallacious failing: hurry and grab-the-med-I-know-is-right-administer-it-and-leave-because-I-know-patient-is-ok (I use the word "know" because have you ever had the experience of "knowing" and found out later you were wrong?) I believe the nurse "knew" she grabbed the right medicine and erroneously "knew" she didn't need to monitor after. I believe it's possible she was being mindless for, what 30 min. to an hour?, based on circumstances we aren't imagining and will never know -- which does not excuse her from nursing accountability but could very well excuse her from criminality if the court interprets the law as it could be interpreted. This is EXACTLY like driving drunk. Buying alcohol is legal. Being drunk is legal. There is no law against drinking and driving because as long as you are not drunk, you can have a couple of drinks and drive. Even if you get a DUI, as long as you don't hurt anyone, nobody charges you with "attempted" homicide. But...if you kill someone, yes...you do...because you made the CHOICE to break the law, the choice to put others at risk and statistics caught up with you. They don't charge you with first degree or second degree murder because the drunk driver didn't get into the car drunk with the intent of killing someone, but they should have reasonably known they were unsafe to drive. Same thing happened with this nurse. I don't believe drunk driving compares to a nurse who skips the medication rights. To realize as a nurse that you are in over your head and to avoid situations where you are, and to realize as a nurse you aren't being conscious enough in the very moments you became mindless due to [insert whatever could make you mindless, e.g. fatigue, distraction, pressure from management, etc.] -- you must be experienced enough to have learned the critical lesson that by striving to be a good worker you very well might be failing to be a good nurse. The Vanderbilt nurse had standards of care she refused to follow. She has a degree, a license, competencies, a completed orientation, etc. She KNEW what the policies were. She just didn't care. This was a willful action...it wasn't a mistake. She purposely bypassed seven check points in place that caused the death of this patient. We don't know what she actually cared about and what led her to fail in all the ways she did. By 'mistake' we mean she did not intend to kill that patient. No, intent is not a criteria for being guilty of the 'reckless homicide' charge but I think 'awareness' is, right? "Purposely bypassed"...I doubt it. To be done "purposely" means she did it deliberately, right? I don't believe she deliberately (which my dictionary defines as: 'consciously'; 'in a careful and unhurried way') bypassed seven check points. I believe she did the opposite. That is, I believe she very unconsciously, in a very careless and hurried way, skipped the safety checks. You are obviously unfamiliar with the penalties for reckless homicide. She is unlikely to serve a day in prison. They can do that in Tennessee. But she will be a convicted felon because there is too much evidence to exonerate her. I hope you're right that no time is served, but I hope you're wrong that she will be convicted a felon. I hope there is a chance the law will be interpreted in the way I have described. Administration has NO BEARING...none, on my ability to practice the five rights of medication. None. This nurse was not a new grad. I have stopped even a physician from interrupting me when I needed to complete a safety check. Well, I'm glad no circumstances such as understaffing could cause you to skip the rights of medication administration. I hope we all become as flawless in that way as you are. She wasn't a new grad but still did not have a heck of a lot of experience IMHO. Then let the limit be this. If a nurse is working in a safe working environment, given a safe work load, and safe work expectations, and if being a "good worker" means the same thing as being a "good nurse" in the facility -- if all that is the reality, and yet the nurse errs in a way that she is solely to blame...Well, then perhaps. I'm of the mindset that we should find remedial solutions rather than criminalize non-violent people anyways, but that's another topic. What you are essentially advocating for is for nurses to be babysat by more policies and procedures. Yet when it's convenient for you and you feel you are being micro-managed you want to say, "But we are educated/licensed professionals!" No, I think overload of policies and too many alarms, signs, extra steps to jump through, etc. are often part of the problem. I'm advocating for this nurse to not be found guilty of criminal charges. Consider the possibility, however remote in your mind, that she did give a flip about all patients and it wasn't because she didn't give a flip that she so badly erred. And if you are going to rally around criminal charges for a nurse, pick a nurse who intentionally killed a patient. After reading all of these threads, something that stood out to me the most is the difficulty many of us have on separating what we know as the diffficulties of working in hospitals with chaos, etc, from an individual nurse that made several series of errors. How can we separate it? The main tool nurses need to prevent errors is our brain, which we need sharp for critical-thinking and present awareness. Our brains are affected by our working conditions and the circumstances that could lead a nurse such as this to be so mindless. Our brains are subject to fail because we are humans. No need to be snotty. And I hope you are flawless in your medication administration. Your patients deserve that.